Dickens’s birthplace in Mile End Terrace, Portsmouth. When we think of Dickens and the Victorian City, we think of Dickens and London. While it is impossible to underestimate the importance of London in Dickens’s work, readers, critics, and enthusiasts inevitably ignore the indirect influence of those other English villages, towns and cities in which Dickens lived, worked, and played, including Portsmouth, the city in which he was born. The significance of Portsmouth in Dickens’s work is often overlooked and little is made of the impact of the city on his work or on related links between Portsmouth and Dickens’s family, and his theatrical, novelistic, and philanthropic interests: Dickens’s father, John Dickens (1785-1851) was a clerk in the pay office of the Royal Navy attached to the Portsmouth dockyard; Dickens’s son, Sydney Smith Haldimand Dickens (1847-72) enrolled in Eastman’s Naval Academy in Southsea in 1859, later joining the Royal Navy in 1860 which he made his career; and the Royal Navy features in a number of Dickens’s works, most notably in Dombey and Son (1846-48). Dickens was baptised on 4th March in St Marys Church in 1812 by his parents, John and Elizabeth. In addition, Dickens visited Portsmouth on a number of occasions, mentioned it in numerous works and, in 1859, wrote an essay on the city in All the Year Round. Furthermore, by some odd quirk of fate, Portsmouth’s more genteel neighbour, Southsea, became the final resting place of two of the women to whom Dickens was romantically attached in his lifetime: Maria Beadnell and the actress, Ellen Ternan. 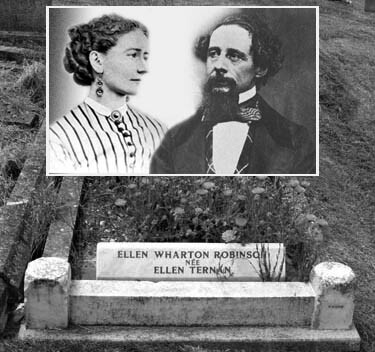 Ellen Ternan, reputedly Dickens’s mistress, is buried in Highland Road Cemetery in Portsmouth. 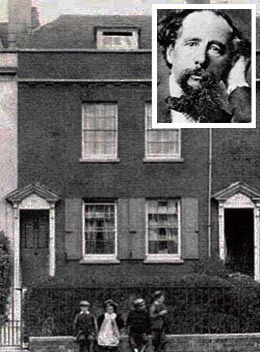 Dickens’s stay in Portsmouth was brief: on the 7 February 1812 Charles John Huffam Dickens was born in Landport, Portsmouth to John Dickens and his wife Elizabeth (1789-1863). The house in which he was born, 13 Mile End Terrace (now Old Commercial Road) has been preserved for posterity and is now known as the Dickens Birthplace Museum. On the 4 March 1812, he was baptised at St Mary’s Church, Portsea, and while the building itself was demolished in the 1850s, and replaced by a new church built in the 1880s, the font in which he was christened remains intact and can be found at St Stephen’s, Portsmouth. 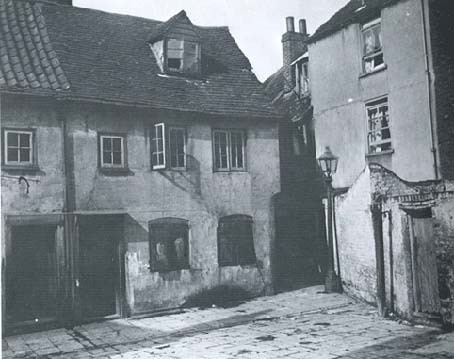 In June 1812, it is thought that the Dickens family moved to lodgings at 16 Hawke Street, Portsmouth, and in December 1813 to 39 Wish Street (now King’s Road) Southsea. Neither building remains: the lodgings in Hawke Street were destroyed during the Second World War and the house in King’s Road has been demolished. The Dickenses remained in Portsmouth until early 1815, when they moved to lodgings in London. Blossom Alley near Dickens’s second home in Hawke Street, Portsea. In total, Dickens’s childhood time in Portsmouth amounts to three years. However, he did return on a number of occasions, and set several chapters of The Life and Adventures of Nicholas Nickleby, serialised 1838-39, in the town of his birth and visited Portsmouth while writing Nickleby. 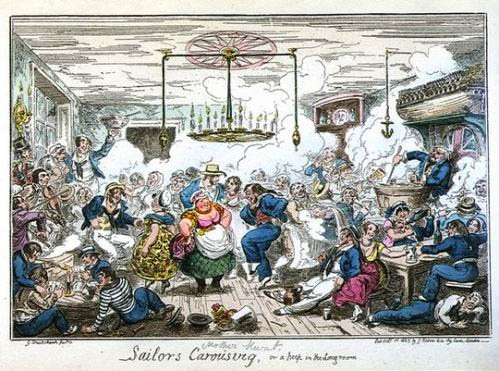 Sailors carousing by George Cruikshank shows inside a Portsea tavern around the time Dickens was born. On the morning after our arrival we set out for a walk, and turning a corner of the street suddenly, found ourselves in Landport Terrace. The name of the street catching Mr. Dickens’s eye, he suddenly exclaimed: ‘By Jove! here is the place where I was born;’ and, acting on his suggestion, we walked up and down the terrace for some time, speculating as to which of the houses had the right to call itself his cradle. Beyond a recollection that there was a small front garden to the house he had no idea of the place—for he was only two years old when his father was removed from London to Portsmouth. As the houses were nearly all alike, and each had a small front garden, we were not much helped in our quest by Mr. Dickens’s recollections, and great was the laughter at his humorous conjectures. He must have lived in one house because ‘it looked so much like his father;’ another one must have been his home because it looked like the birthplace of a man who had deserted it; a third was very like the cradle of a puny, weak youngster such as he had been; and so on, through the row. I give Pirrip as my father’s family name, on the authority of his tombstone and my sister – Mrs. Joe Gargery, who married the blacksmith. As I never saw my father or my mother, and never saw any likeness of either of them (for their days were long before the days of photographs), my first fancies regarding what they were like, were unreasonably derived from their tombstones. The shape of the letters on my father’s, gave me an odd idea that he was a square, stout, dark man, with curly black hair. From the character and turn of the inscription, ‘Also Georgiana Wife of the Above,’ I drew a childish conclusion that my mother was freckled and sickly. To five little stone lozenges, each about a foot and a half long, which were arranged in a neat row beside their grave, and were sacred to the memory of five little brothers of mine – who gave up trying to get a living, exceedingly early in that universal struggle – I am indebted for a belief I religiously entertained that they had all been born on their backs with their hands in their trousers-pockets, and had never taken them out in this state of existence. Portsmouth was, and still is, home to the Royal Navy. The picture above shows looking across to The Dockyard from The Hard. Dickens’s father was a clerk in the Navy pay office. We mount a balcony standing out into the sea-breeze … and from which you can have a capital bird’s-eye view. … Well, there, on your left, is fair ‘Veeta,’ the Isle of Wight, green and round, and with the white town of Ryde glittering in the sunlight at its fringe. There spreads the Channel squadron before you. H.M.S. James Watt, H.M.S. Hero, H.M.S. Algiers, H.M.S. Royal Albert (three-decker), H.M.S. Agamemnon, are the liners. … What a brilliant spectacle Spithead makes with all these vessels lying there, the sunlight glittering on their chequered sides, the wind making their colours fly, and in and out, round and round the floating castles, the white-canvassed yachts, the sea-butterflies among the sea-eagles! Any visitor to Portsmouth today, lucky enough to arrive on a hot summer’s day will recognise the harbour from Dickens’s description, albeit that the naval warships have been replaced by the white and blue of ferries crossing to France and the Isle of Wight: the white-canvassed yachts still weave in and out of the larger ships, the sea still sparkles, the Island remains as green and alluring, and the town of Ryde still glitters in the sunshine. As Dickens’s article demonstrates, his feelings towards his birthplace were ambivalent, by turns critical and affectionate. Nevertheless, as this introduction shows, Portsmouth plays a greater part in his works than is commonly acknowledged. This website, along with the accompanying book, aims to highlight those points at which Portsmouth becomes visible, and to consider Victorian Portsmouth as a microcosmic version of London, sharing with the metropolis, many of the philanthropic and political concerns that animated Dickens during his lifetime. In the last five years of his life Dickens, known for his relentless energy and drive, became increasingly affected by illness and fatigue. During these years, Dickens wrote and published Our Mutual Friend (1864-5) and, with Wilkie Collins, wrote No Thoroughfare: A Drama in Five Acts (1867). In addition, he continued to edit All the Year Round, a task he found increasingly burdensome, and undertook gruelling reading tours in Britain and America. Despite his unwillingness to acknowledge the strain, these final years saw him plagued with a series of ailments that augured a significant deterioration in health and drew what his friend, John Forster called, ‘a broad mark between his past life and what remained to him of the future’. The cumulative effects of these illnesses and ailments clearly made Dickens anxious and in May 1869 he made his will. He died at 6.10 pm on June 9, 1870 at his home in Gad’s Hill Place in Kent, after suffering a stroke the day before, from which he never regained consciousness. Dickens’s death was felt worldwide, yet despite his popularity, his exuberance, and his dramatic nature, he had indicated that he did not want an extravagant funeral or any lasting memorial beyond his own writings. His expressed preference was for a small family funeral and a quiet burial in a local graveyard. However, his public were not to be satisfied with this. On June 14, his body was taken by special train to Charing Cross, and a hearse carried his body to Westminster Abbey where a private funeral was held before he was buried in Poet’s Corner. His grave remained open for many days, so that the thousands who came might pay their respects. His method of composing and publishing his tales in monthly parts, or sometimes in weekly parts, aided the experience of this immediate personal companionship between the writer and the reader. It was just as if we received a letter or a visit, at regular intervals, from a kindly observant gossip, who was in the habit of watching the domestic life of the Nicklebys or the Chuzzlewits, and who would let us know from time to time how they were going on. The loss described here suggests that of an acquaintance, one with whom one might have enjoyed an evening’s chat and entertainment, not a distant literary giant. 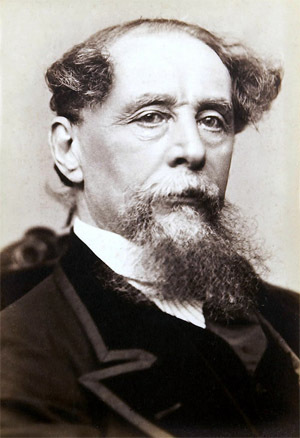 It is perhaps this accessible quality that made Dickens’s private life of concern to the public – in many ways he is a forerunner of the contemporary celebrity. In the days and months after his death, the papers continued to report on the contents of his will; the sale of his household goods, and on the continuing question of whether or not a memorial should be erected to Dickens in his birthplace: Portsmouth. The Mayor of Portsmouth suggests that the memorial should either take the form of some institution in which the novelist would have taken a special interest, or, in the event of a sufficient sum not being realised for that object, that an obelisk, with an inscription announcing the birth and death of Dickens, should be erected in the People’s Park. ‘I enjoin my friends, on no account, to make me the subject of any monument, memorial, or testimonial whatever. I rest my claims to the remembrance of my country upon my published works, and the remembrance of my friends upon their experience of me in addition thereto’. However, as the Guardian reported on 19 August 2011, Dickens’s comments may have applied specifically to his grave, rather than to any public monument elsewhere and, as a result, the Dickens Fellowship Society plans to erect a statue of Dickens in Guildhall Square, Portsmouth, to celebrate the bicentenary of his birth; a fitting accolade to the great author, whose presence in city to date has been marked only by the couch on which he died owned by the Birthplace Museum, Portsmouth. While it is in human nature to seek tangible personal mementos of those who mean something to us, it is worth remembering that Dickens has never required such concrete reinforcement to keep his place in the public eye. His works continue to be sold, read, and studied, TV and film adaptations entice a new generation of readers, and he has even become a character in the novels of other authors. In death as in life, Dickens, larger than life, retains a popularity that remains perpetually undimmed.